Apple has announced that its iTunes customers are currently renting or buying a mind boggling 50,000 plus movies every day from its online store. 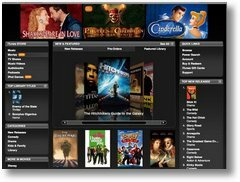 Over 8 million song titles are available on iTunes and a massive 20,000 TV episodes and over 2,000 movies. This also makes iTunes the biggest and most popular movie store on the internet. iTunes provides movies from the worlds biggest major movie studios which include 20th Century Fox, The Walt Disney Studios, Warner Bros., Paramount, Universal Studios Home Entertainment, Sony Pictures Entertainment, MGM, Lionsgate, New Line Cinema and more (so basically everyone!). Online consumers are able to rent movies and view on the Mac or PCs plus the iconic iPods series, iPhone and on widescreen Television with Apple TV. Consumers are also able to grab the latest movies on the same day as the DVD is released to the general public. And to think, i only use my iphone for making calls!! The BBC iPlayer which has always been considered the greatest online tv player has had a makeover. A new beta version of the iPlayer has been released including addidional features such as larger playing screen, a greater integration of TV and radio channels plus a new ‘content recommendation engine’. So basically they have included a radio Player into the iPlayer, a full listing of radio shows and the ability to fast forward and rewind these streams. Also included is a new content recommendation system which is interesting as it observes the viewing habits of the viewer and then offers recommendations based on your particular tastes. This new style iPlayer also gives the viewer a more cinematic viewing experience with a bigger viewing screen. 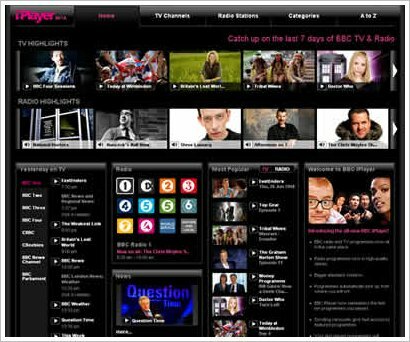 Since its launch on xmas day 2007 the iPlayer has seen over 100 million shows viewed from its serving of over 250 TV shows available weekly and all the radio networks. Ted (torrent episode downloader) is a great program that keeps track of your favorite TV shows and episodes and will automatically download them for you whenever a new episode becomes available. Whenever ted finds a new episode of your favorite show it will announce this from your system tray. Then because he is such a nice guy, ted will load your favourite bittorrent client and will download the episode. Ted comes preset with all the most popular shows such as 24, CSI, Simpsons etc. ted will search for the latest episodes and download them for you. ted uses bittorrent and RSS technology to get you the newest episodes as soon as possible!and also lets you add your own to the watch list. Its a great way to never miss another episode. ted really is the easiest way to download TV shows. Using the best of the torrent websites that are available, ted downloads your shows to your favorite bittorrent client. You can use ted with Azureus, uTorrent, Tomato Torrent, Transmission and many other torrent clients. After your torrent client has finished downloading an episode, you can start watching! It is that easy to keep up to date with your shows! Hmm not the most original but its gotta be here. The biggest site for viewing anything on the web. The videos are all user uploaded videos, so lots of them weird and wonderful and all for free. You can pretty much find any video on any subject here. It’s video â€“ more than 20,000 shows, with more added daily.It’s online â€“ And it’s free. The software P2P app which needs downloading and installing first works pretty good, and if you got a decent internet connection, youâ€™ll be ok using it. A p2p-based online television with a downloadable client focused on European (over 50) channels. Unfortunately, it wonâ€™t work if youâ€™re not from one of the supported countries. The Veoh is a video site similar to youtube. but veoh also holds a large number of TV shows for download in better quality the youtube does. The difference being that the veoh network is used with a veoh player, The player works and looks great for downloading files from the network which sometimes includes, shock horror… copyrighted content. NGTV, which is short for No Good TV, is the television you donâ€™t want your daughter to watch. Or at least it tries to leave that impression: in reality, itâ€™s similar to what kids see on TV everyday: lots of music & entertainment, lots of foul language, and long, long intros for every episode. 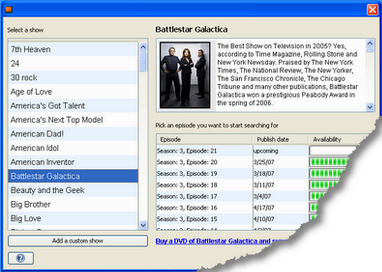 Episode network is a large link list, pointing to videos around the web. Theyâ€™re not hosting any of the videos on the site; but bear in mind that since the material includes blockbusters and entire TV series downloading the stuff might be just a tad illegal. One of the biggest video sharing sites around, Dailymotion is as old as YouTube, and nearly as successful. Unlike YouTube, itâ€™s still not sued by every media powerhouse under the sun, so you can still find a lot of good stuff there. For a list of TV series available at Dailymotion, check out this site. Although Google has bought YouTube and Google Video is slowly fading out of the picture, itâ€™s still a very large video sharing site with tons of content and an UI that wouldnâ€™t mind a makeover. BlinkX is a video/audio search engine which claims to have indexed over 12 million hours of video. Since itâ€™s a search engine, youâ€™re hardly gonna be able to sit back, relax and enjoy the shows, but itâ€™s great for finding that elusive video you think you saw three weeks ago but you were too drunk to remember whatâ€™s itâ€™s called or whatâ€™s it about. Stage6 is a video sharing site built to demonstrate the quality of the DivX codec. It sports a sleek interface and a large selection of videos. Youâ€™ll need a special plugin to access the videos – the DivX web player – but the quality of DivX-encoded videos makes it worth your while. TCUnetworks is a China-based P2P TV company, which means youâ€™re mostly be able to find Chinese channels there, but some of the content is in English, too. A nice selection of all the free streaming tv channels sorted in country order. Phew… so there you have some good sites to wet your whistle, we will add to and compile new lists so that every streaming tv and video site will be mentioned, reviewed and seen here. Just imagine being in total control of your TV lineup.Forget subscribing to cable, satellite or phone services that offer you hundreds of channels you dont want, need and will never watch, you would be in control of selecting and creating what you watch, where you watch it and when. That day may not be so far away. Slowly but surely, content from the major networks that is broadcast over cable and satellite network providers is being distributed and shown via the internet. In terms of the technology, all the elements are falling into place to deliver high quality video from the internet directly to viewers PC’s. Software has and is being developed to ensure the quality of video distributed is top quality and fast. Companies such as Microsoft and Cisco Systems’ Linksys home division are developing products that enable Internet video to be viewed on both TV sets and PC screens. Apple Computer, which has revolutionised the music industry with iPod music players and iTunes music store, is now trying the same thing in the video market. It has alredy introduced iPod’s that play videos, and launched a department in its iTunes store that sells episodes of popular TV shows, such as ‘Desperate Housewives’ and ‘Lost’ along with music videos. All video offerings are currently selling for $1.99 apiece. While the iTunes video library may be limited today, it is clear that Apple’s approach is shaking up the entertainment industry and a new distribution model is now emerging for video content. content providers are treading carefully as they start new internet based distribution channels. As an example, Comedy Central’s new MotherLoad Web site will offer only select clips of content rather than the full range of programming available on Comedy Central’s cable channel. It’s easy to see how the old model for TV might evolve and adapt to distribution on the Net as the necessary technology makes its way into the home. Companies such as Portola, which is launching a product bypassing the traditional cable and satellite distribution models and deliver directly to consumers via the Internet. EdgeStream has already struck deals with several content providers, including Digital Identity in Italy, which enables more than 75 percent of all the streaming traffic on Telecom Italia’s network; TV Plus in the United Kingdom, which offers popular Russian movies, cartoons, documentaries and classical music; and SkyPerfect Communications, Japan’s largest satellite TV broadcasting services company. Earlier this month a Web site called Bollywood.tv, which uses EdgeStream’s technology, launched a service that offers more than 730 Indian movies over the Internet. Kontiki, which has developed software that applies digital rights management rules to ensure video isn’t ripped off, is also seeing more content providers, especially those outside of the United States interested in distributing content over the Web. The BBC started testing Kontiki’s technology in 2004 and is now in the second phase of a technical trial. Sky, a satellite TV provider owned by News Corp., will launch an Internet TV service using Kontiki’s service before the end of the year. Internet search giants Google are also getting into the Internet TV business. In June, Google launched a new Web-based video search service, which allows people to use keywords to search the company’s indexed database of video from content providers that have uploaded video since April. While some content providers, like Comedy Central, are experimenting with Web distribution, most of them are only doing it tentatively. Executives at Comedy Central say its new broadband-optimized site, called MotherLoad, is designed to complement the existing cable channel and not replace it. Content providers like MTV, which runs Comedy Central, seem reluctant to move forward too quickly. They are nervous about losing control of their brands if an aggregator like Google provided access to individual shows or clips of content. These content providers also have to consider the behavior of their audience, which is used to paying cable or satellite companies monthly fees for access to channels that they can “surf.” The technology may be available to stream quality video over the Internet, but whether or not people will abandon the old cable model to go with something totally different has yet to be seen. But it’s clear that content providers like Comedy Central are starting to position themselves for a transition in the market. Comedy Central knows that nearly 85 percent of its viewers have broadband access and tend to be early adopters of technology, so it’s not far-fetched to assume that some of these viewers could also experiment with Internet-based television. Cable providers and phone companies, such as Verizon Communications and SBC Communications, now entering the paid TV market also recognize that customers want more interactive content. And many of them are already providing on-demand programming, which allows viewers to download movies anytime they want. Comcast, the largest cable company in the United States, already provides an extensive library of on-demand movies. On Wednesday it announced it would provide an additional 250 movies every month to its digital cable customers at no extra charge. In total, Comcast customers will be able to select from about 800 movies each month. Comcast says that its video-on-demand programming is extremely popular. The company has already surpassed one billion total on-demand program views for the year, eclipsing last year’s total of 567 million views.